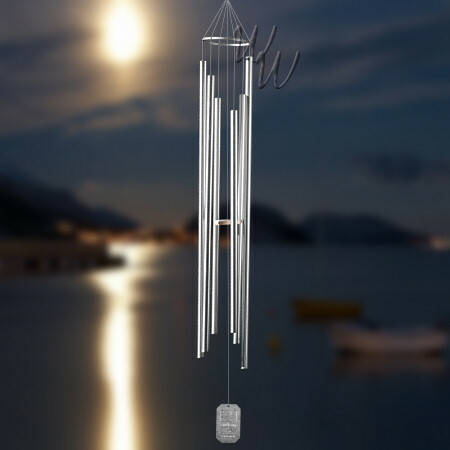 Whimsical Winds Wind Chimes offers more than 800 styles of wind chimes on their online store. Today they are offering their customers an exciting opportunity to win a free Grace Note 108" Extra Large Wind Chime, Majestic Morning Tuned to Big Ben and valued at $540.00. The winner of this beautiful chime will really enjoy the deep tones that hearken the Westminster’s Big Ben clock tower. The resonation will truly brighten your day- that’s what our chimes do best! 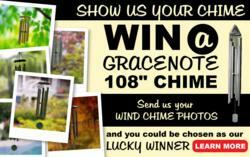 Whimsical Winds, the largest wind chime retailer online, announced today that from March 15, 2013 through July 15, 2013 participants can submit a photo of their chimes, or their beautiful backyard in need of a chime, and the winner will receive a free 108” Grace Note Majestic Morning chime. 100% made in the USA, this chime is more than seven feet tall, carries a perfect pitch to the key of C, and will make a striking addition to any outdoor area. Whimsical Winds offers a sound bite of each chime, to listen to this particular Grace Note Majestic Morning visit the Whimsical Winds Grace Note page. With an offering of more than 800 styles, Whimsical Winds Wind Chimes is the largest retailer of wind chimes on the web. In addition to carrying the most popular manufactures, the site also includes bells, gazing balls and wind spinners from over 14 companies. Shop this site for the perfect gift, memorial, or personal addition to your home.